International NGOs are increasingly important players within the new aid architecture but their geographic choices remain uncharted territory. 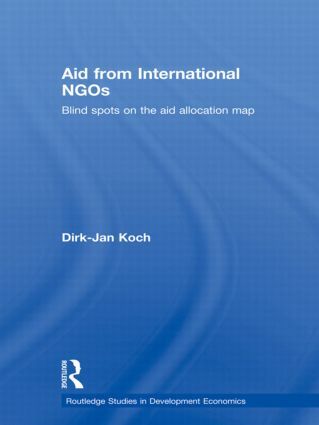 This book focuses on patterns of development assistance, mapping, while analysing and assessing the country choices of the largest international NGOs. Koch's approach is interdisciplinary and uses qualitative, quantitative and experimental methods to provide a clear insight in the determinants of country choices of international NGOs. The book aims to discover the country choices of international NGOs, how they are determined and how they could be improved. This work, which uses a dataset created specifically for the research, comes to the conclusion that international NGOs do not target the poorest and most difficult countries. They are shown to be focussing mostly on those countries where their back donors are active. Additionally, it was discovered that they tend to cluster their activities, for example, international NGOs also have their donor darlings and their donor orphans. Their clustering is explained by adapting theories that explain concentration in for-profit actors to the non-profit context. The book is the first on the geographic choices of international NGOs, and is therefore of considerable academic interest, especially for those focusing on development aid and third sector research. Furthermore, the book provides specific policy suggestions for more thought-out geographic decisions of international NGOs and their back donors. Do country images aﬀect the concentration of NGOs? Back donors’ inﬂuence on concentration: marketization or slipstream? The consequences of concentration of NGOs: does it aﬀect cooperation?